The waters of Strangford Lough run cold, fast and deep, but the experimental technology being tested in Northern Ireland is being promoted as one of the ways to reduce the UK's carbon emissions. It is estimated that harnessing the power of the seas, using wave and tidal generation methods, could meet the electricity demand of 15 million UK homes every year. 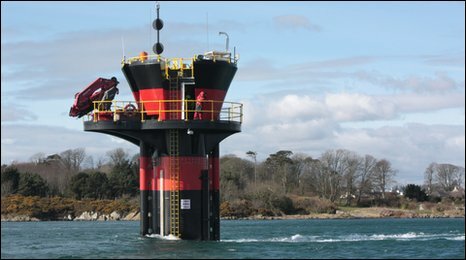 Two years ago energy started being generated at SeaGen, an experimental tidal station off Portaferry in Northern Ireland. Last month the turbine passed 1,000 hours of operation, a first for a marine energy device. The 1.2MW tidal current turbine has achieved a capacity factor of 66% and so far delivered 800MWh into the national grid. Energy Minister Lord Hunt viewed the facility on Monday, as he launched the government's Marine Energy Action Plan. "We have to reduce carbon emissions in the atmosphere if we are going to save the climate," he said. "I have always believed that moving to a low carbon economy also has great potential for the UK in terms of jobs and investment." He said that harnessing the full potential of marine energy could save up to 70m tonnes of Co2 by 2050, with the marine energy sector also providing up to 16,000 jobs. While wind turbines are cheaper to construct the marine sector cites the security of sea energy, even though the technology to utilise it is still being developed. Martin Wright, Managing Director of Marine Current Turbines which built Seagen, said it had the potential to significantly contribute to the mix of the growing renewable energy sector. "What this has done, SeaGen, is successfully prove that it is possible, the turbine is a working example that secure power can be generated this way and is being generated," he said. He added that they were considering asking for an extension to their operating licence, which is due to expire in 2013. In the past two months the firm has attracted more than £8m in funding from Siemens and the Carbon Trust and aims to deploy the UK's first tidal array by 2012. There have been hiccups with the system. It runs essentially as an underwater windmill, but last year lost one of its blades. The propeller was replaced and since then it has been back on course, with seemingly little impact on the surrounding wildlife. Dr Graham Savidge from Queen's University, Belfast, has been monitoring the impact of SeaGen on the lough, which is a protected environmentally sensitive area. He said that their study of what happened when the the turbine was used would inform other areas where such technology could be deployed. "There has been very little impact really, it seems to be quite benign," he said. 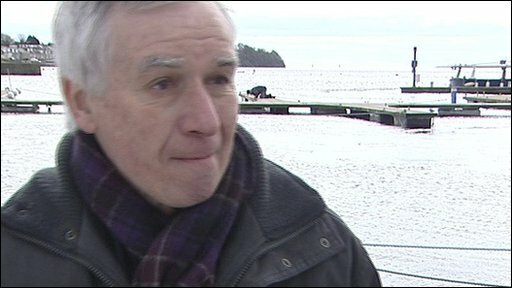 "However, when it started running we noticed that porpoises passing it stop communicating, making those acoustic noises. The numbers have remained stable though at the entrance and top of the lough." A sonar device stops the blades turning when a marine lifeform strays too close and there have been no injuries or damage to life on the bed of the lough. SeaGen is unique for now but next year a single SeaGen system is planned to be deployed in Canada's Bay of Fundy by a Canadian company. Under the government's new marine strategy, tidal energy be part of the long-term plans for marine renewables in the UK. A marine energy supply chain is to be established and a ministerial task force on Marine Energy are to established to oversee future work on the Marine Energy Action Plan.